A hospital hotline has been introduced at our trust to respond to concerns inpatients or their loved ones may have about care. 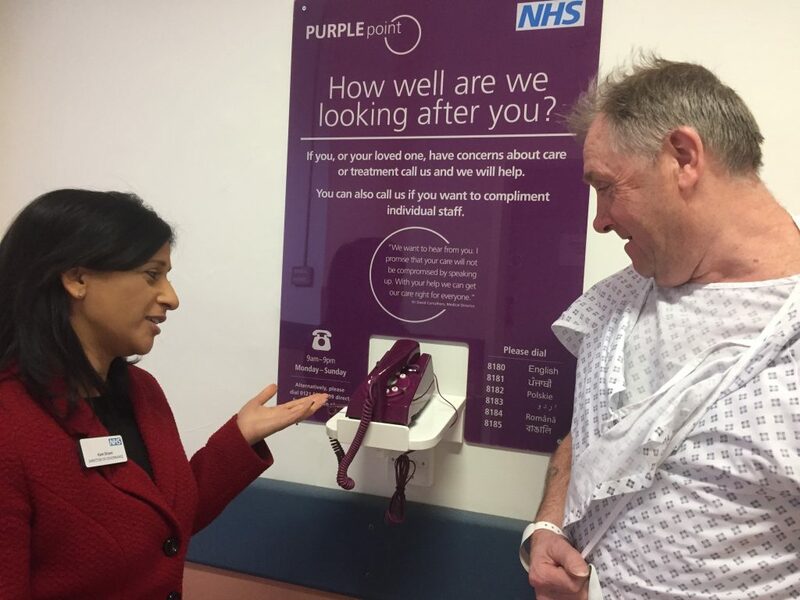 New Purple Points have been installed outside ward areas at Sandwell, City and Rowley Regis Hospitals, which have phones that link directly to a team of advisors. The aim is to address concerns quickly, before the patient is discharged. The phones can also be used to compliment staff for the care they’ve given. The move by Sandwell and West Birmingham Hospitals NHS Trust comes after a survey was conducted by Healthwatch Sandwell, a health watchdog, which found patients wanted concerns resolved in a more timely approach. The phone line will be manned between 9am and 9pm every day. There are numbers for non-English speakers to call. Kam Dhami, Director of Governance, who is leading the project, said: “We have access to a range of patient feedback and we identified a theme through some of our complaints, and from a report carried out by Healthwatch Sandwell, that a more timely approach to issues of concern would be helpful. “Patients will be able to use the Purple Point phone line to tell us about any concerns with their care whilst an inpatient. We will aim to get the concern resolved quickly. They can also use the phone line to report good experiences of care so that we can pass positive feedback onto the teams. The service will also be available in other commonly spoken languages – patients just need to follow the instructions and dial the number corresponding to the language they require. The advisors will speak to the caller about their concern and then make sure that the relevant ward staff are informed so that they can resolve issues quickly. The team, along with the ward staff will also check with the patient that they are happy with the outcome. The phones were launched across Sandwell, Rowley and City Hospitals at the end of February.